Clare Siobhan fans, give me cc! Hi! 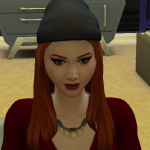 I am a huge fan of https://www.youtube.com/user/claresiobhan and I want to make a save similar to hers (but with diff characters!) starting from the bottom. I need some cc that would help me! - I will only take alpha if it's clothing, bb stuff, or makeup. (I have no problem with alpha, its just that its weird to have maxis match and alpha at the same time. - I have kijiko lashes and glossy eyes already. - I really want the sectional sofa in the dreamhouse she has. - I also want the skin she likes. somehow i decided to download some alpha cc.